Help an artist create a masterpiece of native ogre art. Doranar, an artist, believes the ogres of Wrothgar possess a misunderstood artistic genius. He wishes to create a replica of ogre artwork for the House of Orsimer Glories. Talk to Doranar at Morkul Stronghold. Gather materials for the artwork in Morkul Descent. 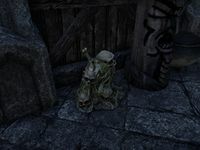 Bring the materials to Doranar at the House of Orsimer Glories in Orsinium. Doronar can be found next to the stablemaster of Morkul Stronghold. "You would think the great artisans of Morkul might appreciate a fellow artist. You would be wrong!" "I'm studying an eminently misunderstood collection of artists native to Wrothgar. But how am I to complete my provocative companion artwork without the appropriate materials?" You're studying the art of the Morkul clan? "What? No, no - the ogres! Their visual arrangement, indiscernible textures, the smells... oh, the smells! Ogres have long realized art should stimulate every sense. I don't suppose you'd care to help me acquire the necessarily redolent materials?" All right. Tell me what you need. "There's an ogre den in a nearby cave called "Morkul Descent". Grab anything ogre-created which has a natural look, feel, or smell. Bring it all to the House of Orsimer Glories and I'll assemble my artwork!" What type of art do ogres make? "I'm not clear, to be honest. It can't be that hard - sticks and twine, maybe a few bones or horns here and there, smashed together with a particularly odoriferous glop! But why are you specifically interested in ogre artwork? "Have you met Preparator Noguza at the House of Orsimer Glories? I overheard her mention ogre artwork was something they'd consider displaying. And if I make the artwork with genuine ogre materials, we both win!" "What an undeniable aroma! Let's see ... bones... more bones ...a slightly different bone ... some sticky goop to hold it all together. My friend, you have outdone yourself." "Have faith! A sculpture begins as a block of stone. A masterful painting? Nothing but canvas on the board. Time to assemble this for Preparator Noguza. Soon, all shall witness my glorious homage to Wrothgar's Ogres!" Preparator Noguza: "What is... this...?" Doranar: "Masterpiece? Delivered as promised!" Noguza: "What is this mess?" Doranar: "Mess? But... this is the authentic replication of Ogre artwork, as requested! The materials came straight from an orgre den!" Noguza: "But the Bloody Curse, Doranar - It reeks!" Noguza: "I understand the gorge rising in my throat." Doranar: "It's... perhaps not my best work." Despite dialogue to the contrary, the ogre art piece will remain on display indefinitely in the museum. Doranar asked me to acquire authentic ogre "artistic materials" for his piece. He suggested I try the nearby ogre den in Morkul Descent. Finishes quest I gathered some "materials" for Doranar's artwork. I should deliver what I found to him in Orsinium. This page was last modified on 28 February 2019, at 14:45.